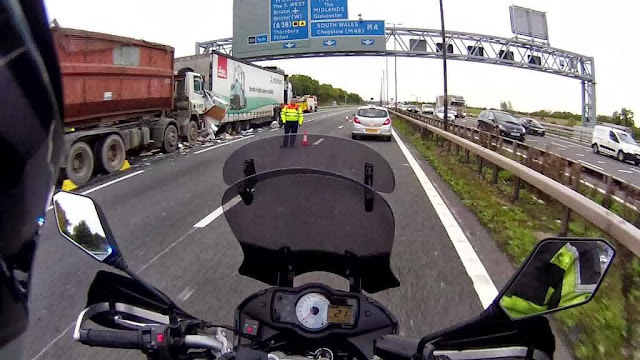 Speedmonkey: Carnage On The Roads - When Will We Learn? Carnage On The Roads - When Will We Learn? I was delayed recently by two fatal accidents on the motorways in one day, which caused me to arrive home 3 hours late - and for scores of people to unexpectedly enter into mourning for those who died. The first first crash closed the M5 for six hours. It involved a van and a lorry. The van driver died. You can see the aftermath here. The second crash happened on the M4 near Bristol. I was on the other side of the carriageway and had no choice but to see the aftermath as we crawled past at 2mph. Two cars were squashed flat, no more than 24 inches high. Two caravans were obliterated and the remnants strewn across the motorway. A huge truck (the type that fly through our village at speed, just where my son crosses the road after school) was parked close by them, without a scratch. A passing biker captured this image on his head cam. He was on the scene just after it happened, I arrived much later. At least one car lies somewhere under those trucks. This goes on every single day of the year. A minimum of three people died in those accidents. Can you imagine if a serial killer was on the loose, taking out three people on the M4 and M5 near Bristol? There would be uproar. Yet these fatalities will go largely unreported. Life will go on for everyone except the friends and relatives of the deceased. Five people die on the UK's roads every day, according to ROSPA. This is madness. It's not the fault of the car, van or lorry. It's the fault of the human in control. That human failed to drive according to conditions. That human was not in adequate control of their vehicle and so either died themselves or killed somebody else. Motorcycle magazines frequently publish articles relating to rider safety and improving skills. Car magazines never do. Safety and skills do not sell magazines. Most people in charge of cars out there do not have the requisite skills and full enough control of their facilities to do so. That's no official statistic, it's my observation. But no-one reading this will disagree. Normally I do not advocate compulsory anything but I think it's time the general public were forced to undergo regular driver training. Those of us who have attended driver awareness courses will know they are actually educational, and make you think. The police control the roads by stealth and underhand tactics. I have no respect for the police when they control us by camera or by hiding with mobile speed traps in areas designed to rake in the cash. This does not improve standards, it simply generates revenue. The driver awareness courses are a success because they are run by outside bodies with no axe to grind, and no condescending lectures. I believe all drivers should have to attend a driver awareness course at least once every five years in order to retain their licence. And all foreign drivers who will be in the UK for more than a week or so, or who drive here regularly, must do the same. One of the most sensible and level headed advocates of driver education is a man called Paul Ripley. For seven years he wrote a weekly column in the Daily Telegraph. You can read a selection here. Please do so, and please send the link to everyone you know who drives a car. You can browse Paul's website here and follow him on Twitter here. Only us car enthusiasts seem want to educate ourselves. Nobody else seems to want to educate Britain's drivers so we must encourage them to educate themselves. I would like to run more. If anyone wants to send me some wisdom, or thoughts, on driver education or safety please let me know.